Some stuff from Eugene Speedway. Big ad for a big race. The two day Intermountain Cup from Salt Lake City. Rain messed up Billy Foster's second day. Jim Malloy won the overall points to get the title. Been fooling around on the internet (always a bad sign) and there are a few newspapers online that have local race reports. A few to tide us over while I try to sort out a better chronological look at the series. This one from Salt Lake City, Utah. Steve McQueen's birthday happened earlier in the week. It's being celebrated by various blogs, etc. Here's one that has a Steve McQueen blog-a-thon going on that has some essays: one on Le Mans and another on McQueen's cars. 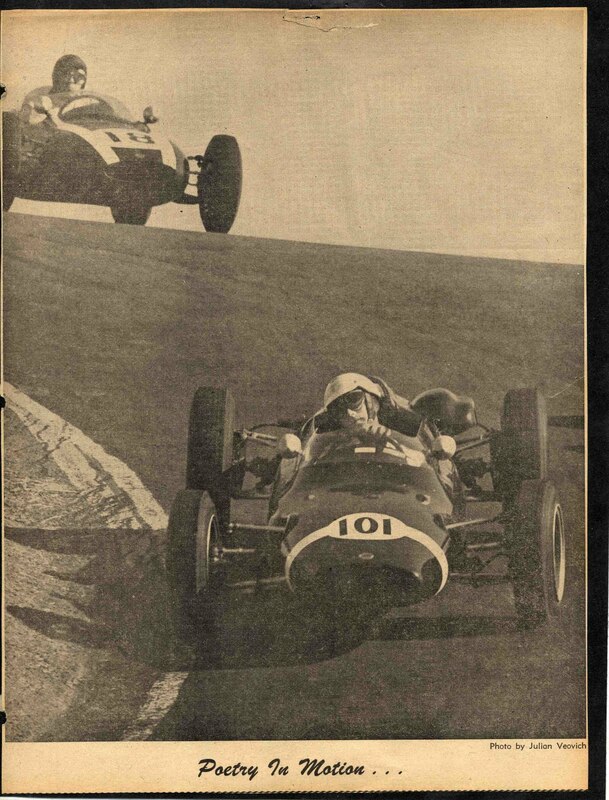 The photo up top is of Steve in his Formula Libre chasing Vancouver's Bob McLean at Laguna Seca, 1963. Some more information on False Creek Speedway from 1957. Always good to start off with a bang, or a fire. Two kinds of midgets, open wheel and stock cars. I guess we'd call them foreign stocks now. Mel Keen, "King Keen", "Mad Mel", was one of the top drivers at Digney Speedway. He wins an early 1957 feature at Digney Speedway. A few typos in the text: Ken Klatt (not Platt), Ken Koester (not Kester). Here's something I don't have much on. A kids' track in the Fleetwood area of Surrey. Seems too early for go-karts. Maybe they were quarter-midgets. Anyone have information? Sorry, got lost for a few days. So Digney Speedway re-opens for the 1956 season. As good a place as any to get back at it. Happy birthday to Trev Deeley Motorcycles! Here's some history of the dealership. And yet even more Trev Deeley clippings from 1939. Some more Trev Deeley clippings from the 1939 Con Jones Park races. This Saturday (March 13th) Trev Deeley Motorcycles is having a birthday party. Their 90somethingth. Here's a few clippings from Trev's first season of racing. Not sure if the top photo is actually of Trev, newspapers, in cahoots with promoters, could be somewhat devious in their ways of presenting the "ballyhoo". Another one gone. 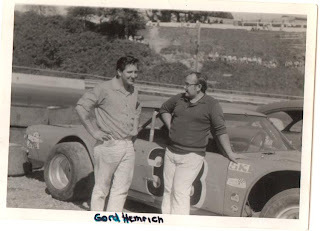 Mechanic Ed Roe (who worked on the Gordie Hemrich cars for decades) recently passed away. He won numerous "best mechanic" awards at Langley Speedway and was recognized as a Greater Vancouver Motorsport Pioneer in 2009. The photo above had Ed Roe standing with Gordie in the Langley pits circa 1970. Recently learned that Ernest "Dig" Digney passed away late last year. 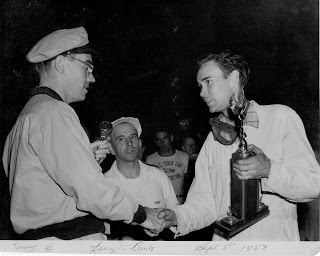 I've used the old photo before in this archive for a Larry McBride entry but the guy on the left presenting the trophy to Larry is "Dig" Digney. (And for the sake of being a completionist, the guy in the middle is mechanic Tommy Youngston, Larry's wrench.) Photo is circa 1952/53. The photo below is of Joyce and Ernie Digney back in 2008 at Kaija Kalevala's birthday party. I never saw Tom Slick until just a short while ago. Me being a lazy sod you think I would have but it appears the cartoon was part of the George of the Jungle show. And George was on a channel we didn't get when I was growing (?) up. So both George and Tom aren't part of my childhood. Time for a second (fifty-second?) childhood. 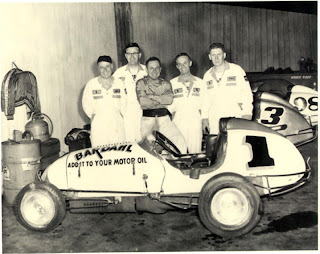 A picture of Templeman and crew with his potent Bardahl Special. An interesting letter from Shorty Templeman published in Racing Wheels many years ago. Shorty is more interested in how much he lost rather than how much he made racing. Came across a few interesting items about Shorty Templeman, the Washington state midget racer. He first came up to Digney Speedway in 1948 for the opening race in July. One news item has him winning the race but, as pointed out in an earlier posting, the official record has the win going to Bob Vorbeck. Later that season Templeman had a bad sprint car crash at Spokane. He survived and came back to race, and win, at Digney. The weird part of the story is that the crash seemed to help him grow taller. My favourite (so far) photo of the early go-kart days. This one from the Simpson Sears parking lot up on Kingsway in Burnaby. Lorne Oakes wearing a football helmet. The guy chasing him smoking a cigarette. Some more information on karting's early days in Vancouver. Chuck Robinson was the first president of the B.C. Go-Kart Association. Chuck was an early hot rodder, and like Milt Goodman and Jim Greenwood, moved with the times gathering new enthusiasts to new forms of motorsport. I don't know how long the Power Kart enterprise lasted but they obviously thought there was a few dollars to be made. 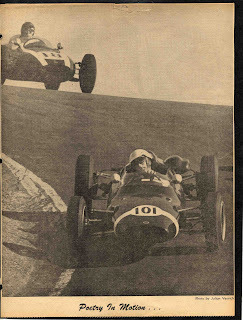 1959 seems to have been the year that go-kart racing broke out all over the place. Here's a link to an early Popular Mechanics story and a Popular Science story on the sport. And a photo of an early race/demonstration at Vancouver's Oakridge Mall parking lot in 1959.